Having seen over half the movies I set out to watch and having written about only a few of them, it has become clear to me that there won’t be 100 List of Shame posts because there simply isn’t all that much to say about all of them. Some have been briefly reviewed in Saturday Links and Suddenly, Last Month posts, but other’s remain lonely Letterboxd diary entries. So apart from some movies that I know I’ll want to write about at length, most films will be “reviewed” at updates such as this one – because this thing can’t happen just outside the blog! I’ve managed to sort most of them in little categories, but there’s always that odd bunch that refuses to fit anywhere. Let’s start with those. NOTE: I’VE ALREADY TALKED ABOUT APOCALYPSE NOW, YOU CAN READ ABOUT IT HERE. About a year ago I was all over James Stewart’s filmography – it was the peak of my classic movies phase, one that sadly seems to have subsided every since oscar season. But winter is always better for those black and white gems anyway, don’t you think? I can’t say I loved loved loved Mr. Smith Goes to Washington, but its greatness is easy to recognise, as is the quality of Stewart’s powerful performance. The sky was cloudy, the afternoon cold, and that is the perfect setting to get comfy and watch It’s a Wonderful Life. If you can get the people you love to sit with you through it, even better. I distinctly remember being moved by George’s struggles, and smiling at his pure adoration for Mary. I don’t remember much more, but for me this is enough to know I can’t safely recommend it to anyone around Christmas time. In my journey through The List of Shame I found that some movies don’t quite strike me as hard as I was expecting them to at first watch. The Graduate was one of those movies. I found it immensely cool, I enjoyed seeing Dustin Hoffman in such a role, and I could see the allure of the Mrs. Robinson affair – but I was a bit out of it, to be honest. Perhaps one day I’ll give it another go. Not sure I know what all that was about, but 2001 is a hypnotising and beautiful film that has haunted me to this day. So, I’m gonna read some stuff on it, and get back to you on this one. After our Cool Guys Don’t Look at Explosions podcast episode I learned two things: that Arnold Schwarzenegger can be rather appealing with his mouth shut, and positively hilarious when he opens it (I mean that in the best way possible); and that with Stallone it’s the other way around. So the stage was set for a watch that has been a long time coming, Rocky. I didn’t think I’d like it – best case scenario, I figured I’d be able to see how good it was within its genre. But guess what, I LOVED it. I was completely into it all, rooting for Rocky, getting all fired up, finding his love for the girl adorable (no doubt that was there for the ladies), and close to raising my fist with him. AND, it was funny. I was shamefully unaware of Stallone’s greatness, but then, that’s why this is called The List of Shame. I’m guessing he won. I was really tired. Very creepy and very memorable, it really is a good horror movie. Another one like The Graduate. I saw it, but I didn’t see it. I guess it’s like Anna Kendrick in Pitch Perfect: next time I watch it, there will be a grand awakening. And yet another one that wasn’t mind blowing, but still honestly enjoyable. Great work from everyone in it, lots of laughs… and it is a great movie, yah? Have you seen any of these movies? If not, shame on you! What an amazing list. You truly crossed off some classics. I loved that you loved Rocky, as my sister recently saw it and felt the same way. I came to The Graduate late as well, and really only appreciated it after the second and third viewings. As for The Breakfast Club!?! Hopefully you do indeed have a Kendrick-esque awakening, because that movie is sooooo good, let alone iconic. I really really really loved The Breakfast Club. It’s such a great film — I hope it will catch on with you one of these days, too! I really love your list though, and it’s really impressive that you’ve seen so many of them! I hope so, too! Oh I always feel like I’ve barely scratched the surface: I’ve got like 300+ movies in my watchlist, and a great deal of those are classics, too! List of shame is a great idea to catch up with iconic older films, but there’s so many i must’ve missed i just didn’t want to feel pressured about it XD so many films so little time right? I had to take the pressure off of myself, precisely because of that. I started this list maybe… 2 years ago, so you can see I’m taking it really slow. It’s just a way of reminding myself of the “great movies” I still have to see. In the meantime I’ve seen many more classics that aren’t in the list, so it’s really a very natural process. Rocky does sound like the kind of movie to watch with dads, or older brothers. 🙂 Out of those two I’d recommend Mr. Smith Goes to Washington more, just because it’s such a powerful performance! Nice post. 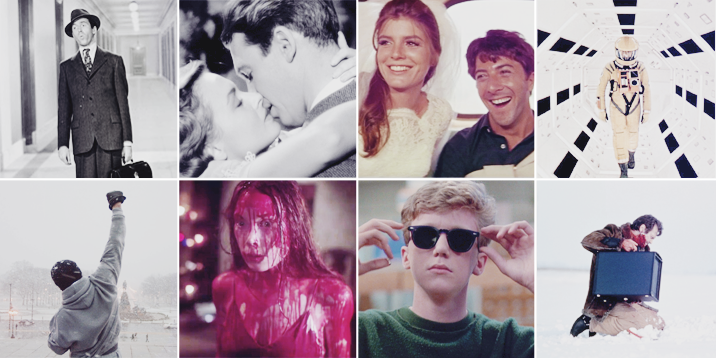 I love so many of these, especially 2001, It’s a Wonderful Life and The Graduate. Rocky used to be one my favorite films, so it’s great that you loved it, too.